Mast-Overall Raised Height: 226" Approx. Gross Weight: 16,800 lbs Approx. 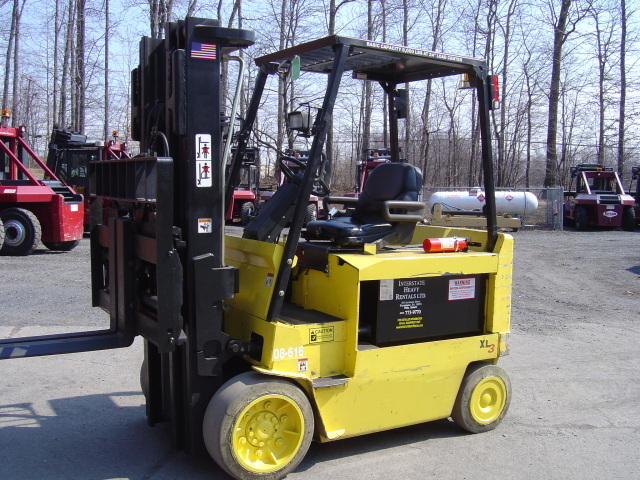 Details: The 8,000# capacity Hyster forklift is a heavy duty electric forklift that can be used in many areas of manufacturing such as the steel industry, canned goods, rigging, as well as general warehousing and distribution centers. This unit from our rental fleet is unique as it has an EE rating. An EE rating is when all motors and switches are enclosed to prevent sparks from escaping. This type of truck can be used in some hazardous areas. The unit is also equipped with a side shifting fork positioning clamp, and non marking tires.